Excellent performance by the entire ensemble cast. Every character was utilised effectively. I especially enjoyed the performances of Charlize Theron(Cipher) and Dwayne Johnson (Hobbs). The movie was littered with breathtaking stunts, car chases and action sequences , but still managed to have a strong, believable storyline. Time was not taken to introduce the numerous characters to audience members not familiar with the Fast and Furious franchise. I was not a fan of Fast and furious 7 , so i went into this one with very low expectations. The hype around Fast 8 was huge as is to be expected from this popular franchise. 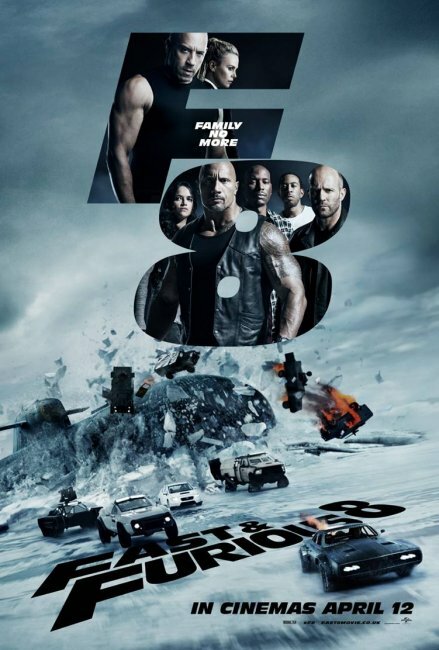 I happy to say that Fast and furious 8 (The Fate of the furious) was head and shoulders above it predecessor. I thoroughly enjoyed the movie. It had a nice blend of the adrenaline-spiking action scenes ,stunts, and fast car, that you expect from a Fast and Furious movie, coupled with a splendid storyline. The standout performance came from Dwayne ‘The Rock’ Johnson (Hobbs). His character could easily be the lead if Vin Diesel were to step down. That being said Diesel ( Dominic Toretto) delivers his most dramatic and emotionally-rich performance in a Fast & Furious movie to date. Tyrese (Roman Pearce) was simply hilarious. Charlize Theron brings an air of malice and ice cold villainy to her character, Cipher. This is a must watch for fans of the Fast and Furious saga. Indubitably this is not the last instalment in the franchise. I am exited to see what they will come up with next . I loved this movie. It was well directed. And Vin Diesel’s baby in the movie is extremely cute and expressive… Awesome Movie indeed.